In the internationally best-selling The Bone Season, Paige Mahoney escaped the brutal penal colony of Sheol I, but now her problems have only just begun: many of the fugitives are still missing and she is the most wanted person in London. As Scion turns its all-seeing eye on Paige, the mime-lords and mime-queens of the city's gangs are invited to a rare meeting of the Unnatural Assembly. Jaxon Hall and his Seven Seals prepare to take center stage, but there are bitter fault lines running through the clairvoyant community and dark secrets around every corner. Then the Rephaim begin crawling out from the shadows. But where is Warden? Paige must keep moving, from Seven Dials to Grub Street to the secret catacombs of Camden, until the fate of the underworld can be decided. Will Paige know who to trust? The hunt for the dreamwalker is on. Sixteen hours of audio – sixteen long, agonizing hours filled with tension and often even fear – and still it wasn’t enough to satisfy my need for this series. Samantha Shannon may be young, but her talent is astonishing. 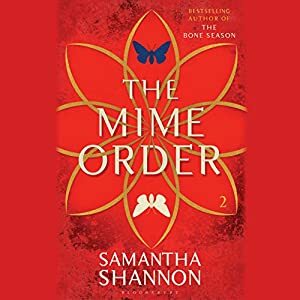 The Mime Order picks up where The Bone Season left off, with Paige Mahoney once again in London with Jaxon Hall and the Seven Seals. But while everything seems to be exactly as she’d left it, Paige herself is irrevocably changed. Not only is she aware of the Rephaim’s existence, but she is, for the first time, strong enough to stand for what she believes in, even if it means going against the man who gave her life as she knows it. The majority of this book deals with the damage to Paige and Jaxon’s relationship. Jaxon, being his usual self-absorbed, power-hungry self, is unwilling to back Paige up in front of The Unnatural Assembly. Unlike her, he thinks that clairvoyants should remain blissfully unaware of the danger that successfully hides behind their government. The pacing is once again extremely slow, but I find that I have the patience needed to fully enjoy it. The allure of Paige’s world is in its intricacy, and as Shannon took the time to slowly reveal the chilling details, I was able to take my time and fully enjoy them. I had my doubts about the return from Sheol I to London, but the transition was done beautifully and seamlessly so that I never felt the loss – if anything, Paige’s world was expanded and built upon skillfully and with infinite care, giving us so much to learn, and even more to look forward to. Ah, but the slow dance between Paige and Warden is the highlight of this book. Their subtle moves towards each other are both terrifying and thrilling. There is so much mistrust to overcome, so much prejudice and fear, and yet the two are drawn to each other like magnets, until nothing matters but the pull between them. This is an agonizingly slow romance that will surely develop into something unforgettable in the five upcoming books. There is very little hope for them and they both know it, but we readers simply have to put our faith in Samantha Shannon and hope for the best. At this point, Alana Kerr with her soft Irish lilt seems like the only choice for narrating these books. There aren’t many audiobook narrators who could make 16 hours seem like no time at all. I would never even consider a different format for these books. Why would I, when Kerr has become Paige in my head, and hearing this gorgeous story directly from her seems like the only way to go. If after sixteen hours you are still begging for more, then that is saying something! I love your love for this series Maja! I LOVED The Bone Season, and this is very high up on my list. So I admit that I skimmed your review :) I can't wait to sink my teeth into it - I expect it will be pretty mind-blowing - yay! I still need to read The Bone Season. But Alana Kerr sounds like a great audiobook narrator - I'll keep an eye out for her work. Hearing your review for this audiobook makes me tempted to listen to the third book instead of reading it! I think I need to get the audiobooks for this series. I have an ARC of book one that still needs to be read, but after reading your review, I think audio is the way to go. I have the first book and need to get to it. It is good to know that I need to find time when I have the brainage to deal with the details. Hm... might have to try it on audio (at least the second book which I don't have). Brilly review! You know what I have this and just haven't slipped in..maybe I should grab the audio...thank you for your thoughts :) I am excited. I actually really appreciated the slow pacing in the first book because, in this instance, it allowed the tension to build and me to really get into the story completely. I'm always so impressed with young authors who have this level of talent. I listened to the first on audiobook and I can't imagine reading them. It was SO SLOW! I even struggled a bit with the audio because of the pace. But it was fascinating and I LOVE that romance that isn't a romance yet. It's a complicated world though and I almost wish I had waited until more books were out cause I'm afraid I'll forget stuff. I loved The Mime Order and it was everything I wanted it to be, much to my delight. From start to finish, this book is truly something special and I know that readers will simultaneously loathe and love Shannon after that cliffhanger TMO ends with. I need, need, need, need book three more than air at this point and I just know it will be bloody brilliant.